Do you know CDU alumni who are shaping society, their career or having a positive impact on other peoples lives? or if you would like to share your career experiences and achievements with other alumni, current and prospective students. We want to hear about them! Submit your story idea here. “My work is very demanding but equally rewarding. I have the privilege of walking beside people after they have injured themselves to advocate for them and to ensure that they are receiving everything that they are entitled to under insurance schemes that are difficult, if not impossible, to navigate without legal representation.” Read Rachel's story. “I value the fact that CDU is uniquely Territorian and provides excellent facilities and services from the library to technology to the quality of teaching and education.” A proud Territorian of Larrakia heritage through his mother, CDU Alumnus John Rawnsley is an accomplished solicitor with the North Australian Aboriginal Justice Agency (NAAJA). He graduated in 2007 with both a Bachelor of Laws and a Bachelor of Aboriginal and Torres Strait Islander Studies. Read John's story. “I enjoy coming up with new ideas to improve current health care technologies. Finding solutions that are simple and more efficient than the existing ones makes my job more challenging but enjoyable.”Mohamed Elgendi is a shining example of what can be achieved by Charles Darwin University graduates. Read Mohamed's story. Even at 84, it’s never too late to study! I chose NTU because it offered me an alternative pathway to enter the world of academia. Born 1924 in London, England, my schooling was cut short by the outbreak of World War II. Read Judy's story. The 2014 NT Australian of the Year and NAIDOC Artist of the Year, Shellie Morris, is one of Australia’s finest singer-songwriters and a passionate supporter of the CDU Theatre redevelopment project. Read Shellie's story. After ending her 10-year career as a chef and starting a family, Samantha found a new pathway and says CDU did change her world! Read Samantha's story. After completing a Masters degree in Management, Diane moved to New York City where I worked for the cosmetics company L’Oreal. In 2006, she immigrated to Australia, and in 2011 she took a life-changing holiday to the Red Centre, read Diane's story. It was on holidays in Switzerland in 2007 that Le experienced the beauty of the Swiss Alps and found inspiration for a new career in protecting and caring for the environment. CDU Alumnus Le’s travel adventures continued well after he started studying at CDU, read Le's story. "Indigenous lecturers were important for me..."
From a young age, Brionee was drawn to social justice issues; she wanted to empower people and help them find their voice. Through dedicated study at ACIKE and guidance from a CDU, Alumnus Brionee has followed her dream. Read Brionee's story here. Joanna, who graduated from CDU with a Bachelor of Engineering in 2013 says she will never forget CDU and now works for Darwin consultancy firm Wallbridge & Gilbert RFP read Joanna's story. "We weren't just a sea of faces..."
Jasmine, who graduated from CDU with a Bachelor of Science in 1994 in its former incarnation, the Northern Territory University is thankful for the close relationships with her lecturers, and smaller classes read Jasmin's story. "It was at a Careers Fair that I landed my job..."
Engineering Graduate, Binil Baby, had no idea CDU’s school BBQ’s and careers fair would lead to his dream job in Townsville. Now employed by Baulderston-Lendlease follow Binil's journey. Steven received the IT Ambassador Award, 2014 for ‘Outstanding Commitment to the promotion of Information Technology’ and has never looked back. Read Steven's story. Since Graduating from Charles Darwin University in 2013, Marley Mitchell has carved a successful career as a Graduate Civil Engineer with Western Australian Civil and Mining contractor, Brierty in Darwin. Read Marley's story. “I thoroughly enjoyed studying at CDU..."
Nathan’s role at the Minerals Council of Australia is to liaise with member representatives regarding key policy issues. His journey with CDU involved scholarships, work placement and even a Canadian exchange. Read Nathan's story. 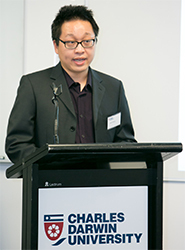 “I wish to help improve the quality of life...."
Jayson began his PhD at CDU in 2010, after receiving an Australia Awards Scholarship from the Department of Foreign Affairs and Trade. He said the scholarship provided him with a rare opportunity to grow both professionally and personally. Read Jayson's story. “The best advice I can give is not to be afraid to try things out..."
Lianna is a Business Development Executive at a national real-estate company and passionate about building design and drafting. After completing a Bachelor of Communications, she was encouraged to continue study at CDU in the area of building design and drafting, while working in her dream area. Read Lianna's story. "I think any opportunity to give back to your community generally is a great thing." Casuarina Square centre manager Ben Gill graduated from Charles Darwin University with a Bachelor of Business in accounting. Hear Ben's story about giving back to the community through being a member of the CDU Alumni. Ben is now a Divisional Director with The GPT Group, one of Australia’s leading property companies. He has direct responsibility for Highpoint Shopping Centre in Melbourne’s north-west. The asset is the fourth largest shopping centre in Australia and is valued at a little under two billion dollars. Ben continues to hold strong associations with the Northern Territory, including family connections, property investment and board membership of Somerville Community Services, the Northern Territory’s largest disability services provider. "I am excited about the CDU alumni network." Calista Hudson qualified with a Certificate IV in Fitness from CDU. She went on to win the 2013 Northern Territory Vocational Student of the Year, and in 2014 was awarded the Charles Darwin University Chancellor's Medal. Calista is a part-time lecturer in Fitness at CDU. Listen to Calista's story. "There are lots of ways you can give back to the University." Jason Schoolmeester is the Executive Director of Economic Policy in the Department of the Chief Minister for the Northern Territory Government. Hear Jason talk about how he stays connected with CDU.